Christopher Nolan’s “The Dark Knight Rises” burst onto the screen with a record-breaking $160 million dollar opening weekend. While this isn’t the biggest opening weekend of all time, it is the largest for a film that was only released in 2D and not 3D. 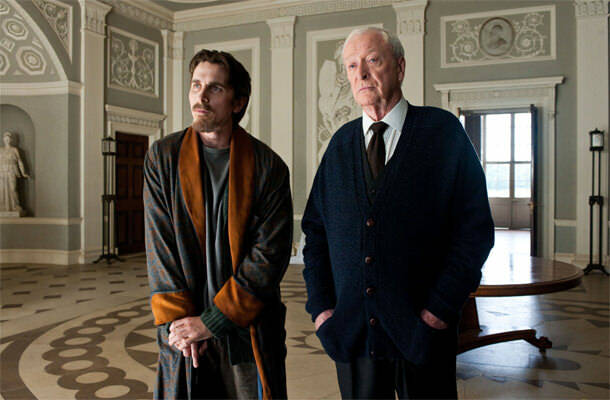 Nolan’s previous efforts “Batman Begins” and “The Dark Knight” are among the most critically celebrated movies of the last decade. “The Dark Knight Rises,” however, fails to live up to that same level of quality. To start with where “The Dark Knight Rises” succeeds, look no farther than the performances on display from some of the finest actors working today. Though no singular performance equals that of Heath Ledger’s Joker from “The Dark Knight,” it’s obvious that all actors were swinging for the fences on this final outing. Tom Hardy excels as the villainous Bane, who is as intelligent and frightening as he is physically imposing. Anne Hathaway is a triumph as Selina Kyle, the first true femme fatale of the entire Christopher Nolan series of films. 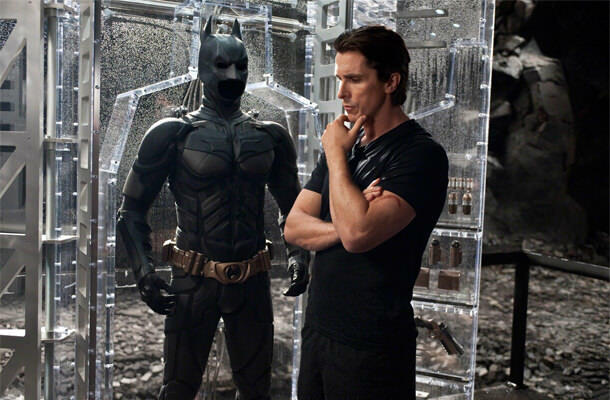 You can even go as far as to say that Christian Bale gives his best performance as both Batman and Bruce Wayne in this film. Veteran actors Michael Caine and Gary Oldman round out the all-star cast with the level of quality that one has come to expect from two experts in the field. Neither has all that much to do, but they make the most of their screen time at every opportunity. Another area where “The Dark Knight Rises” excels is its sense of spectacle. Between the opening seven minutes, which can only be described as a fight scene between two aircraft, to the finale that features literally thousands of extras all battling it out on the streets of Gotham, “The Dark Knight Rises” is definitely the biggest and most epic film of Christopher Nolan’s career. It may go down as one of the most epic movies ever filmed. 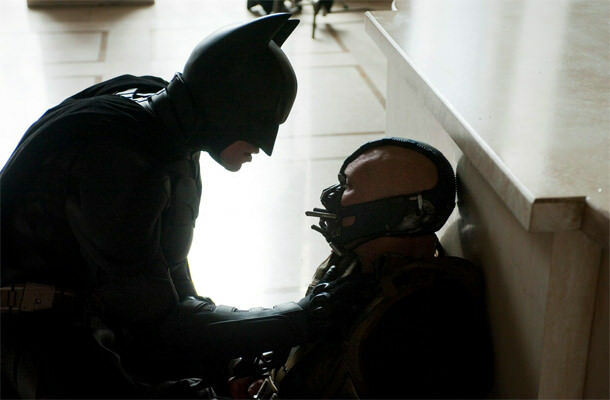 Where “The Dark Knight Rises” fails is its story. Gone is the tight, concise storytelling of “Batman Begins” and “The Dark Knight.” “The Dark Knight Rises” is a bloated mess. Long stretches of its running time are devoted to setting up elements of the plot that don’t ever really pay off. There are also gaping holes in the plot that make you wonder how this script ever got past a first draft. One potential misstep of the film was that it attempted to put a definitive end to the Batman legend. In the comic books, the character of Batman and his story has no such ending. By creating an ending and working towards it, it robs the rest of the plot of any momentum. Another problem is that the motivations of the characters and the evil plots at hand are so messy and convoluted that the movie is really only interesting as you try to figure out what’s going on. Once you know what’s happening, the movie becomes less involved and very detached and emotionless. In conclusion, “The Dark Knight Rises” is definitely worth seeing. However, it’s probably only worth seeing once. It certainly won’t have the longevity of its predecessors. Here’s the problem I have with articles and responding comments like this: people seem to be over-opinionated on the matter! Everyone HAS an opinion; I get that but you start to read the article and the comments and you start to realize that not everyone can be satisfied! Either YOU liked it or YOU didn’t. Or hell, both. Over the course of the years, I’m actually tired of hearing about Ledger’s performance. It was excellent of course; but man, every time! Wow. I got it. Sometimes it seems that people are judging the film by details no one gives a crap about. They use words like “makes no sense”. Who cares about little details! It’s good guy, bad guy, beginning, middle, end. Like it, hate it, whatever! What I didn’t like about it was that so many elements made no sense. A big one was the wall street scene and the entire bankrupt Bruce Wayne plot. Has the writer never even thought about how the stock market or investing in general works? It would have been comical had in not been so dumb. I might be able to excuse the notion of the fusion reactor as a bomb plot since maybe there are people who wouldn’t get why for technical reasons this would never work. A hint is the low radioactivity of and short halflife of the fuel. By the first scene change there would be no useable fuel left for an explosion. But back to the wall street scene… to think that first off a computer on the trading floor would even recognize Waynes fingerprint is silly but to imagine you could even get access to Waynes finances as though billionaires do their trading through an etrade account instead of a managed brokerage is dumb (heck even my broker would have stopped Bane) And trading wasn’t stopped the moment Bane broke in? Nonsense. But even if this takes place in a moron universe where the above could happen… a single trade is made in that 15-20 minute period (or probably far longer) with cameras and dozens of witnesses seeing that it’s a bogus trade and yet it’s processed? To be completely critical it wasn’t even a trade. It was a put option… it’s contract not a stock trade. Wayne could have just said “nope not gonna honor that contract”. Okay there are several other nonsense plot holes but those two are the ones that made me wonder if the writer made it out of third grade without some cheating. Why is this article re-printed in 2014? Though, I think a part of the reason for the “let’s end it” feeling was.. because they need to end the Nolan saga and squeeze in another re-boot before Justice League comes out.